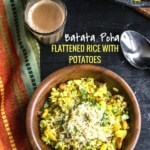 This Batata Poha recipe is dedicated to those who want a great tasting (and looking) Poha. Say goodbye to mushed up poha! Poha makes for a wholesome and delicious breakfast. You can dress it up with sev, pomegranate seeds or roasted peanuts or don’t garnish it at all.. either way, it will be just as satisfying. Before we proceed further, let me clarify the dish is named poha after its main ingredient that also goes by the same name. 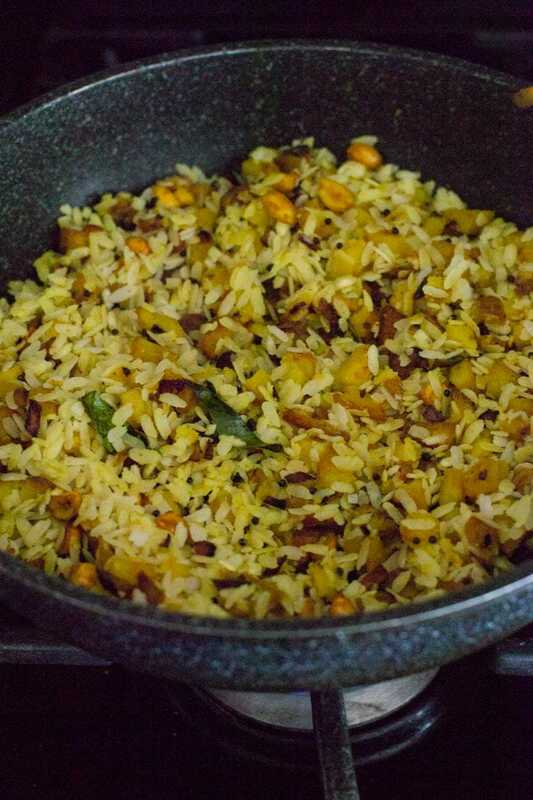 Though mostly eaten for breakfast, poha makes for a satisfying meal any time of the day. 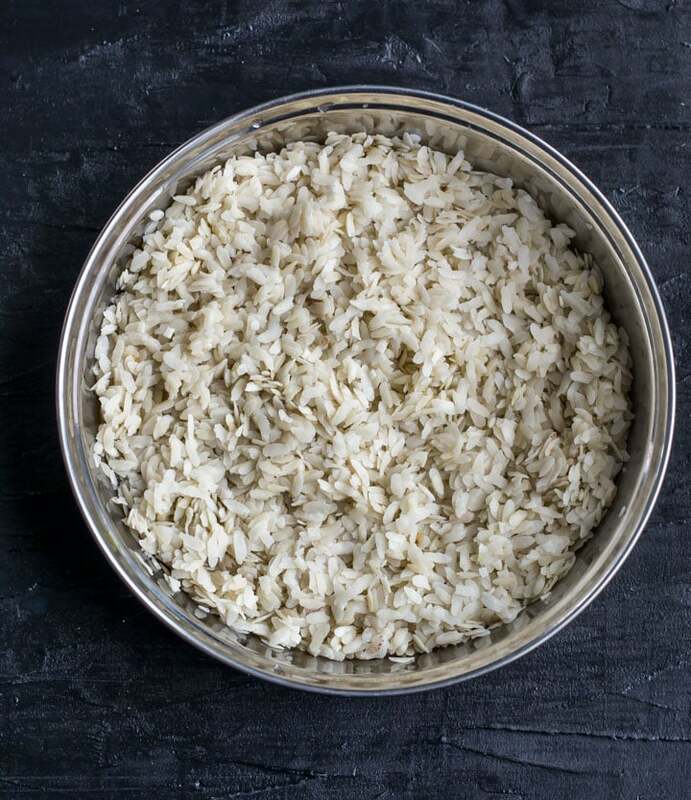 Also called flattened, pressed and flaked rice, poha (the ingredient) is made by parboiling rice and then rolling, flattening and drying them to convert into flakes. Depending on the pressure used in the flattening process, they turn out to be either thick or thin. Thin poha soaks up water and can get mushy in no time and that’s why for this dish thicker poha is preferred. Rinse the poha in a colander and set it aside. Start with the tempering process – Heat oil in a non-stick wok/kadhai over medium heat and once the oil heats up, add mustard seeds. When the mustard seeds start spluttering, add onions, along with curry leaves and peanuts. Add potatoes – Fry the onions for a minute or two and then add potatoes. Mix well. Cover the wok and lower the heat to medium-low. Cook the potatoes for about 10 minutes or until done. Stir once in between. Don’t boil the potatoes beforehand. Boiled potatoes can make your poha mushy. Saute them in the wok/kadhai to cook them. Use skinned roasted peanuts to save time. That way you don’t have to dry roast them before using. No need to saute the onions till they are soft and translucent. 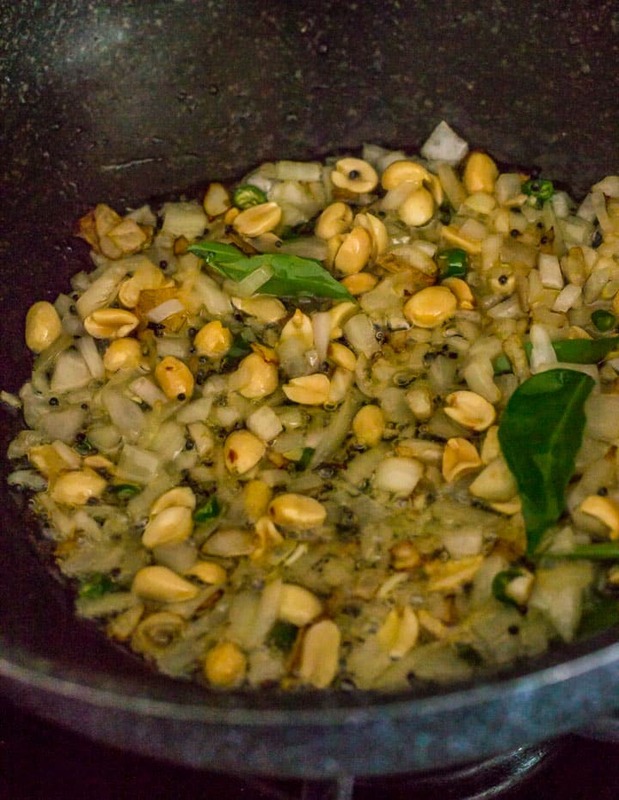 Fry them in oil for a quick minute with peanuts, green chili, and curry leaves. Add potatoes and mix well. The onions will cook along with the potatoes. Use only thick poha. The thin ones will absorb water making the dish mushy. 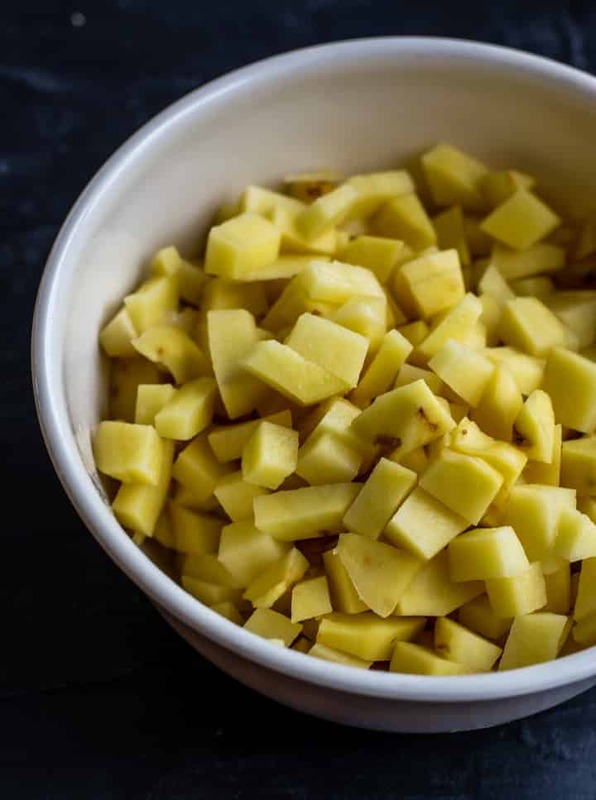 Cut the potatoes into approximately 1-inch cubes. They will cook faster. Rinse the poha in a colander and set aside. Do not soak the poha in water for a long time. 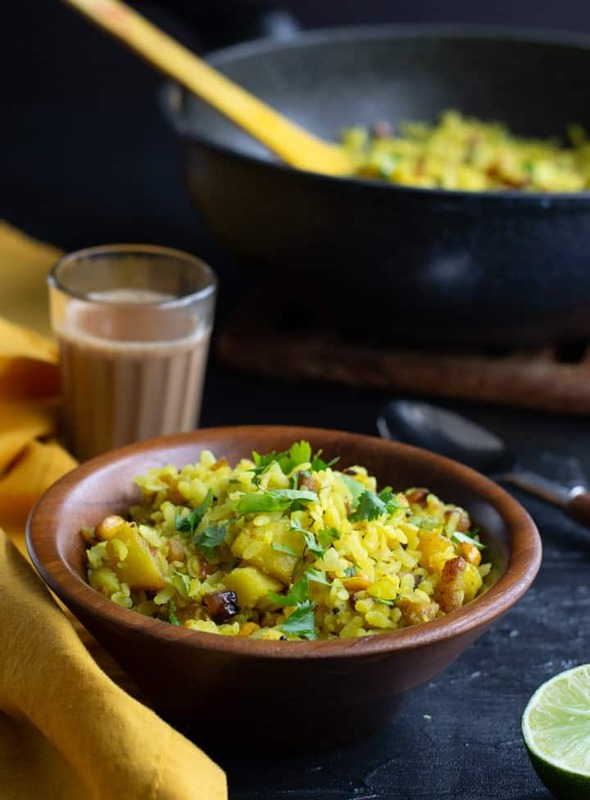 Kanda (onion) poha – Follow the recipe below but skip the potatoes. 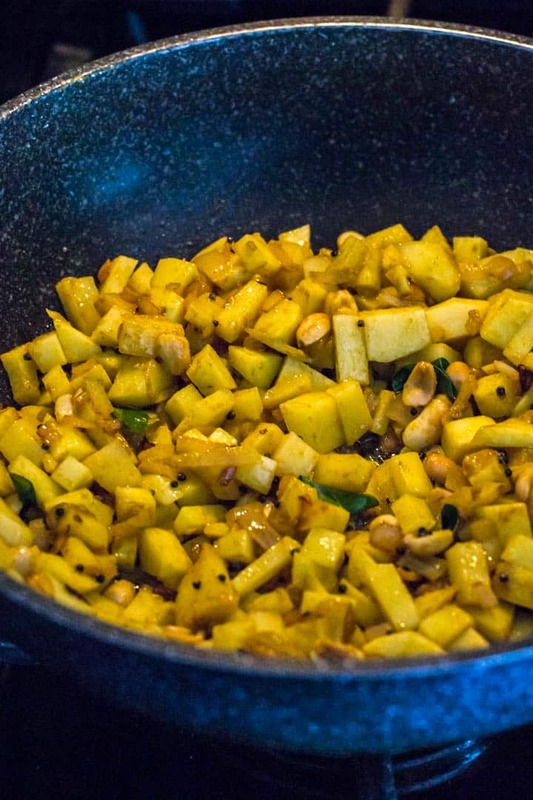 Batata (potato) poha – Check out the recipe below. 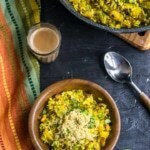 Indori poha – A popular street food from Madhya Pradesh ( a state in central India). 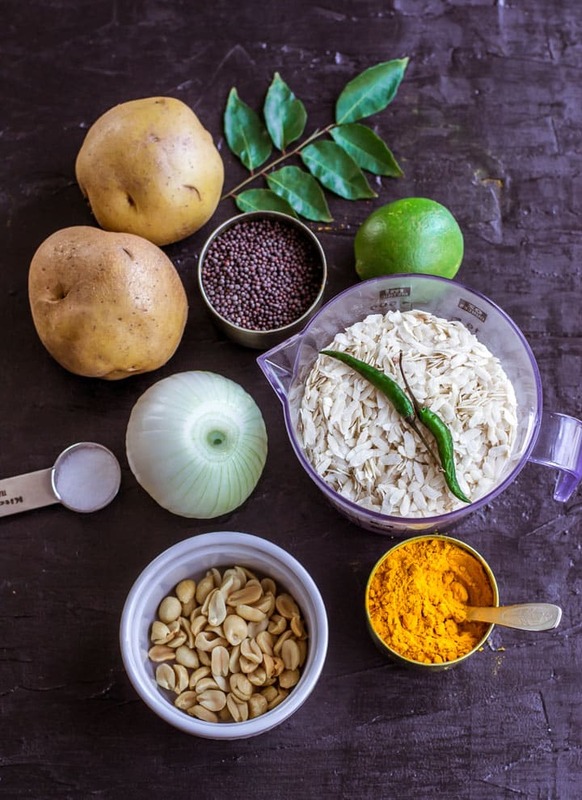 It has a lot going in terms of flavors and textures – a bit sweet, a tad tangy and served with sev, poha made this way is a street food lover’s delight. Vegetable poha – Add veggies such as peas and carrots to the mix along with potatoes, and you’ve got yourself a veggie poha. 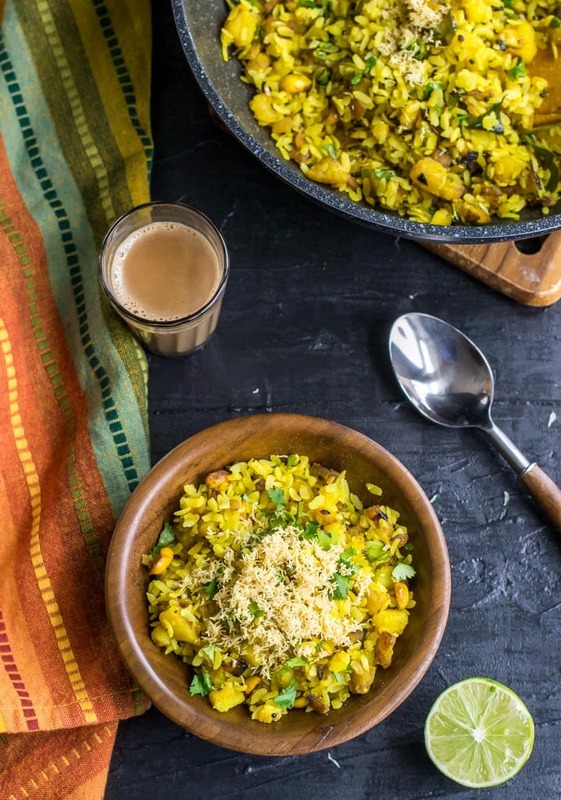 Poha makes for a wholesome and delicious breakfast. You can dress it up with sev, pomegranate seeds or roasted peanuts or don't garnish it at all.. either way, it will be just as satisfying. Heat oil in a non-stick wok/kadhai over medium heat and once the oil heats up add mustard seeds. When the mustard seeds start spluttering, add onions, along with curry leaves, green chilies and peanuts. Fry the onions for a minute or two and then add potatoes, salt, turmeric powder and sugar (if using). Mix well. Cover the wok and lower the heat to medium-low. Cook the potatoes for about 10 minutes or until done. Stir once to avoid sticking. Add poha and lime juice. Mix well. Let it cook for about 5 minutes. Take off heat. Garnish with coriander leaves and sev. Serve immediately.